My name’s Ayumu Hoshi and I’m an aspiring producer. 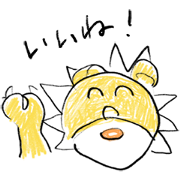 I’ve brought HOSHI-PRO’s Donimal, Cosmof, and Monjuro to LINE! I drew them myself. What do you think? Friend NTT Docomo’s official account to get them for free.